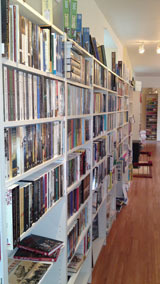 Our range of audio books and Naxos music Cd's is as wide as ever and the catalogues for the Naxos CD's is located at the base of the stand for your convenience. Naxos offer a wide range of very high quality recordings of classical and jazz recordings at very reasonable prices. 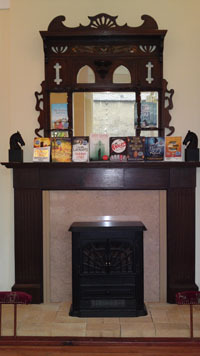 On entering our new premises you will be instantly reminded of our old shop as we have recreated our fireplace and chaise longue to add atmosphere and to allow you to sit and view books in comfort. Our selection of titles is very extensive and anything we don't have on the shelf can usually be ordered and delivered to us within 24 hours. We carry a large selection of Scottish interest and history titles, current fiction, "the Classics", dictionaries and encyclopedia, maps and atlas', audio books and a wide selection of craft books. 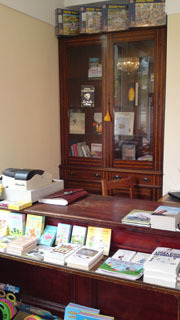 Hive is a new online initiative which enables you to order from the comfort of your home while nominating your favourite bookshop as your supplier - either you pay 99p for home delivery or you have free delivery to ourselves and you just pop in and collect your purchase when we email you to say it has arrived - this service is free. Check Hive out today to see what offers are available. As always we carry a wide range of authors and subject matters. We have an extensive range of baby and toddler titles with wonderful illustrations alongside the traditional and time tested. We also have a variety of teenage genres and also all the curriculum linked titles.